The ability of organisations to cyberconnect is becoming increasingly important for superior performance. Cyberconnecting: The Three Lenses of Diversity by Dr Priya E. Abraham explains how to establish connections across technological, cultural and social boundaries, mirrored in organisations succeeding in today’s hybrid business world. Some companies create and innovate technology; others use and adopt it; but in the cyberage, both must closely interconnect tech with human behaviour. Face-to-face and cyber-interactions are at the heart of effective work-based relationships, which in turn increase organisational performance. To build these effective business relations, organisations must foster the discovery muscle - curiosity combined with skills - in individuals. Priya E. Abraham shows how seemingly opposing domains (technology, business anthropology and diversity) best leverage interactions for the benefit of organisation development, using findings from practitioner-focused research conducted when leading complex cross-boundary projects in the telecommunications and mobile learning industries. Tools from business anthropology help uncover people’s diverse needs and expectations in a cyberconnected world. Identity portfolios need reflection in development solutions of face-to-face and mobile applications. Solutions uncovered by qualitative research methods help close the gap between human behaviour and tech to engage internal and external stakeholders. 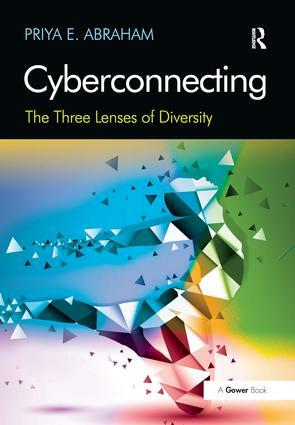 The book presents a much-needed strategic framework required for cyberconnecting: 'The Three Lenses of Diversity’, designed to organise thinking in the navigation of technological, cultural, and social boundaries. Priya E. Abraham is a former professor and senior consultant at a leading UK business school and start-up entrepreneur. Dr Abraham’s strong international orientation and experience was gained by leading multi-million-pound management development projects across Europe, the Middle East and Africa in the telecommunications, energy and airline industries, among others. She holds an MA in cultural anthropology from the University of Vienna and an Executive MBA from the Open University. Her doctoral research in business anthropology at the Universities of Vienna and Stockholm led to the development of the framework ’The Three Lenses of Diversity’. She works at the interface among academia, business and technology.